After the release of her new film Kangaroo: A Love-Hate Story Contributing Editor Lindsy M. Bissonnette was able to ask her some questions about the making of the film and what it's like being a woman in the industry. Lindsy M. Bissonnette (LMB): Was there a specific moment or experience that inspired you to create this gripping documentary? Kate McIntyre Clere (KMC): Kangaroos are one of the most recognizable icons in the world and have always held a fascination for us. We didn't think there had been a film that had explored this icon before. So we set out to discover the wonder of this magnificent and unique animal that we recognized was the heart of a complex and divided situation in Australia. We knew opinion was split around this famous icon and that would make an interesting story but once we started the research and interviews we were shocked to learn that millions of kangaroos are shot each year as so-called pests and sold for profit. LMB: Were you ever in danger while creating this documentary? KMC: The key to telling this story was investigating the details behind the largest wildlife slaughter in the world, to find out where it all started and why it still happens today. We knew we would have to immerse ourselves in all aspects of the story and we worked to get interviews from the many differing stakeholders. At times this was uncomfortable and in this film there was definitely some situations where it was more of a men’s business situation. It was essential to have some great guys on our team. LMB: What were some of the challenges you faced while working on the film? KMC: We learned that there was so much hidden around the treatment of kangaroos. The killing of kangaroos happens at night, in the countryside far away from the wider population. Reports on the daily treatment of kangaroos never gets any media attention and both shooters and farmers were often reluctant to tell their stories. In addition, science that comes from the government and industry is used widely, but we found if scientists had differing opinions their views were not reported. There seems to be a lot more reported in Australia about the management of pests than the magnificent wildlife. LMB: What are the challenges you are still facing on this film (if any)? KMC: We have weaved together an unsettling story for the world to see. Many people are shocked when they hear what actually goes on. In Australia we know that is will cause a heated and uncomfortable national debate. LMB: What is one of your favorite moment of creating/working on this film? KMC: Filming the Big Red kangaroos in Sturt National Park. Seeing the largest males at over seven feet tall took our breath away. Large mobs of kangaroos hopping across the savannah, mothers nurturing their young, joeys jumping in and out of pouches and so many other. [It was] so beautiful to see this magnificent creatures in the wild. LMB: What are the challenges of being a female filmmaker? KMC: As a wife and a mom with a full-time job, it’s always a challenge getting the balance right. Our projects take 3-4 years and it’s really important to be working on films that keep inspiring and challenge me. LMB: What is your hope for this film? KMC: After what we have learned, we want a rigorous debate in Australia and across the world about the treatment of and respect for kangaroos. LMB: What is the next step for the film? 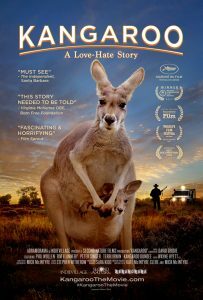 KMC: Kangaroo: A love-hate story is playing in theatres in the USA and Canada and will open in Australia March 15th. Plus we want communities to host their own screenings, there are sign-up sheets on kangaroothemovie.com. Later in the year the film will be available on digital online platforms and broadcast on TV. LMB: What is a piece of advice you’d like to give to other female aspiring filmmakers? KMC: I think being an intern is a very wise step for any young filmmaker. I am still learning about filmmaking with every new film we make. There are so many shifting variables for each film, so many of the skills are learned through real life experience. Therefore the more films you can attach to, the more ready you will be to make your own films. Find the films and directors that inspire you and see if you can intern. Have notebooks, write down all that you learn, your ideas, keep curious, watch life, listen, all these ideas will come in handy. LMB: What is one piece of advice you would give your younger self, knowing what you know now as an artist? KMC: It is a brilliant life being an artist and one worth fighting for! But you will need to be fit, tenacious beyond reasonable, even-minded and endlessly passionate. Prev postFemale Cinematographers – What’s the big deal?